The historical ambiance and majestic architectural composition of Petra reflect the heritage of Jordan. Representing the ancient Arab culture and ethnicity, Petra holds the position as one great icon of Jordan. Also known as Al-Batra in Arabic, it is considered as the treasure of the Middle East that reveals the life of people in that era. Half built and half carved on stone, Petra gives the structural majestic knowledge in the ancient times. It is believed that Nabataeans, southern Arab people who were nomadic and industrious holds the privilege of constructing the Petra as a trade route for to and fro movement between Southern Asia and Greece. 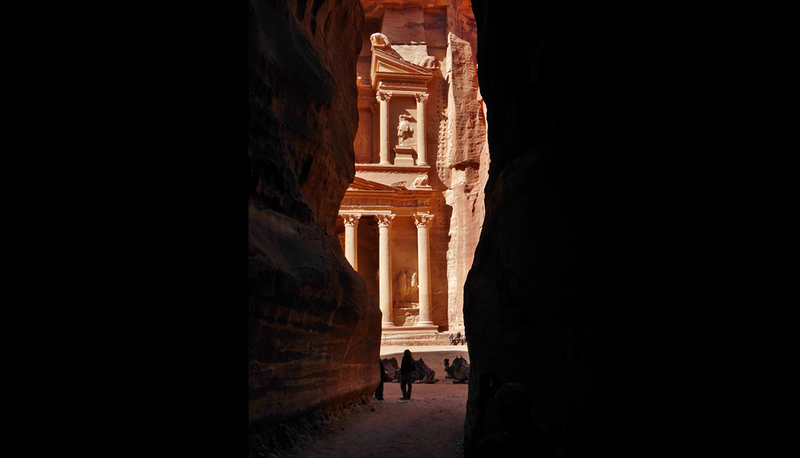 Let’s get in deep with the Arab civilization of those times that make Petra as one of the world’s heritage site. 1. The rose red colored sandstone hills and the surrounded red-tinged mountains give the reddish appearance to the Petra, therefore, it is also well known as Rose city. Also, because it was discovered by a Swiss explorer in the year 1812 which is about thousands of year later to its construction, gives it the name as ‘Lost city’. Numerous rock-cut buildings are featured that are made on the slope of Mount Hor in Jordan. 2. Extraordinary entrance of Petra which is about 1 kilometer long trail through a narrow canyon makes it even more amusing. The cliffs of the sides of the entrance are as long as 80 kilometers called as Al-Siq. It is believed that Petra was made in three different eras namely the Edomites in the 18th to 2nd century BC, the Nabateans in the 2nd century BC to 106 BC and the Romans from 106 to 395 BC. However, the remains of only the Nabateans are left in today’s date. 3. The magnificent stone cut architecture and the carvings that are almost 2000 years aged shows the oldest metropolis in the world. It contains about 800 individual monuments encompassing numerous buildings, tombs, halls, temples, gateways and colonnaded streets that are one of its kinds. A place must-see in Petra is Al Khazneh that literally means treasury being carved straight out of a cliff. 4. The efficient water system that can provide water to about 30,000 people at that time in a dry desert is a matter of amusement till date. Not just this, the lush greenery and beautiful gardens gives the impression of a high water system in the area. There lies one 2,100 pounds sandstone kaput monument of Dushara who was Petra’s primary male deity. 5. Most of the structures of the city have been either weakened or devastated by the effect of the Dead Sea flowing in the area. The salt that gets crystallizes in the wall and the columns of the building is in the way of making the condition of them even worse. But still, it holds the privilege of being one of the most visited places in the country. 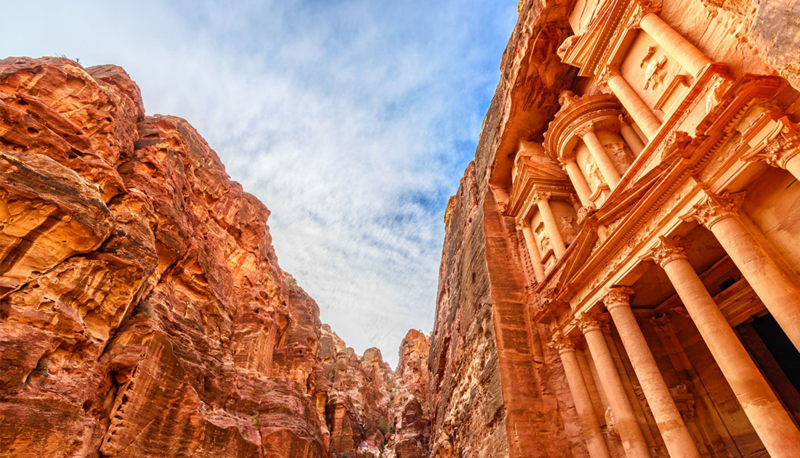 Jordan’s top-notch tourist attraction; Petra got enlisted in UNESCO’s world heritage site in the year 1985.